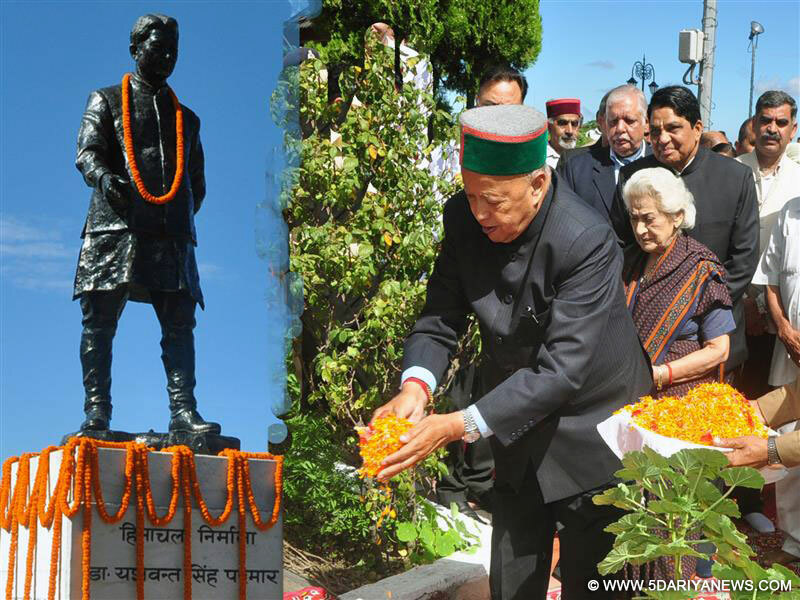 Chief Minister Virbhadra Singh today offered floral tributes to the architect of modern Himachal Pradesh and first Chief Minister of the State Dr. Y.S. Parmar on his 110th birth anniversary in a function organised at State Vidhan Sabha.Presiding over the function, the Chief Minister said Dr. Parmar was a great visionary leader who led the State through all odds with a dream to emerge it as a model State of the country. He always thought for the overall development of State and upliftment of the poor, farmers and horticulturists and common man was on his priority agenda. He said that Himachal Pradesh would ever remain indebted to him for generations to come since it was under his leadership that the State got a separate identity amongst hill States. Shri Virbhadra Singh said Dr. Parmar pleaded for the merger of those hilly areas of Punjab with Himachal Pradesh which had similar culture and life style. He also gave boost for three fold farming as a result of which State’s agrarian economy, particularly horticulture sector made rapid strides. He said that real tributes to Dr. Parmar would be to realise the dream of prosperity, education and progressive Himachal Pradesh and follow the path shown by him.He said that Dr. Parmar was a multi-faceted personality who had left indelible mark in the hearts of the people of the State of his being straight forward and champion for the cause of the common man. It was due to his tireless efforts that Himachal Pradesh became 18thState of the country and since then it had fast progressed ahead on the path of development and prosperity. He said Dr. Parmar united the Congress party in the State and today, the party was working on his ideology. He said today there was a dire need to work whole-heartedly for the cause of the people of the State irrespective of any consideration of caste, creed, and region and above party politics. The Chief Minister said that the State had today emerged role model and steadily forging ahead on the path of progress and prosperity adding that every section of the society especially poor had benefitted from the policies and programmes being implemented with special emphasis laid on welfare of the common man.Speaking on the occasion Speaker, H.P. Vidhan Sabha Shri BBL Butail remembered the contribution of Dr. Parmar in the formation and development of Himachal Pradesh. He said Dr. Parmar was a visionary leader who made numerous progressive plans for the development of this hilly State. Keeping in view the topographical conditions of the State, Dr. Parmar laid special emphasis on construction of roads, power generation and giving boost to horticulture and agriculture sectors to ensure overall development of the State and upliftment of poor and weaker sections of the society.Butail said Dr. Parmar was a simple man who had thorough knowledge of the culture, customs and socio-economic conditions of the State and it was under his able leadership that Himachal Pradesh attained statehood in a peaceful manner. Deputy Speaker Shri Jagat Singh Negi presented vote of thanks.Former Speakers Shri Radha Raman Shastri and Shri Gulab Singh Thakur, Irrigation and Public Health Minister Smt. Vidya Stokes, Social Justice and Empowerment Minister Dr. (Col.) Dhani Ram Shandil, Chief Parliamentary Secretaries, MLA’s, State BJP President Shri Satpal Singh Satti, family members of Dr. Parmar, former Ministers and MLA’s, Chief Secretary Shri V.C Pharka and senior officers of the State Government paid floral tributes to Dr. Y.S Parmar.Earlier, the Chief Minister paid floral tributes at the statue of Dr. Parmar at Ridge Maidan along-with Irrigation and Public Health Minister Smt. Vidya Stokes, Social Justice and Empowerment Minister Dr. (Col.) Dhani Ram Shandil, MLA’s Shri Suresh Bhardwaj and Shri Sanjay Rattan, Mayor Shri Sanjay Chauhan, Chairman, HP State Co-operative Bank Shri Harsh Mahajan, Vice Chairman, State Forest Corporation Shri Kewal Singh Pathania, Deputy Commissioner Shri Rohan Thakur, Commissioner MC, Shimla Shri Pankaj Rai, former Mayors, family members of Dr. Parmar, other senior officers of the State Government and people from all walks of life.Patriotic songs were presented by the artists of Information and Public Relations on the occasion.